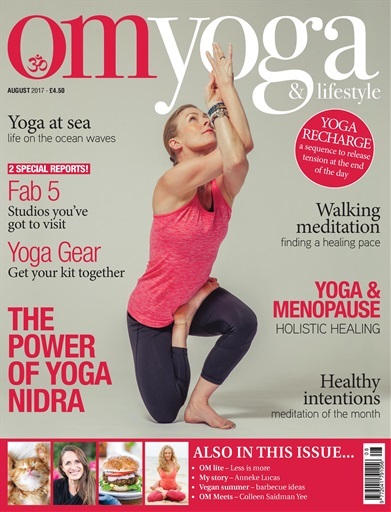 (1 Customer Reviews) | Write Review 12 issues per year Designed to inspire and to energise, OM magazine wants to help you enjoy a more active and rewarding life, drawing on the physical and mental disciplines of yoga, an ancient practice just as popular today as it was thousands of years ago. We take our exercise seriously but this is more than a health and fitness magazine. At OM, our goal is to both entertain and to enrich, to nurture your soul at a time when the world around you may be pre-occupied with more material concerns. Each issue contains easy to follow yoga sequences plus instructions for achieving individual poses. A wealth of meditation, nutrition and wellbeing articles to help guide you in your lifestyle choices. In every issue we aim to nourish body, mind and soul, to galvanise you into action, and to challenge how you feel about the world around you and the people and things in it. 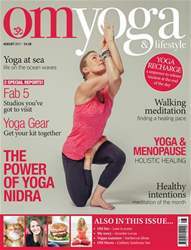 Looking for OM Yoga Magazine in print? Unfortunately pocketmags.com does not sell print copies of OM Yoga Magazine, but all is not lost. Our partner at magazine.co.uk sells print subscriptions at the best prices online. Welcome to our August issue. This month, we’ve got everything you need to keep your practice fresh and alive...on and off the mat. There’s some great yoga instruction, sequences, anatomy and meditations, plus a whole lot more goodies too. Look out for some inspirational stories, including from two incredible American yoga ladies, Colleen Saidman Yee and Anneke Lucas. We also take a look at the Power of Yoga Nidra, as well as yoga’s beneficial impact on managing the menopause. And, inside, you’ll also find not one, but two, special reports showcasing some of the nation's top yoga studios (The Fab 5), as well as a guide to upgrading your home practice with some nice new yoga gear (Get Your Kit Together). Have a great month and see you on the mat real soon. You'll receive 12 issues during a 1 year OM Yoga Magazine magazine subscription. Below is a selection of articles in OM Yoga Magazine August 2017. You'll receive 12 issues during a 1 year OM Yoga Magazine magazine print subscription.